Imagine you want to apply a boudary condition in a mesh but you have elements with all its nodes in the boundary. This will cause a calculation problem because the value of the element is the interpolation of the values of its nodes. You can avoid this problem generating a proper mesh without elements with all its nodes in the boundary. 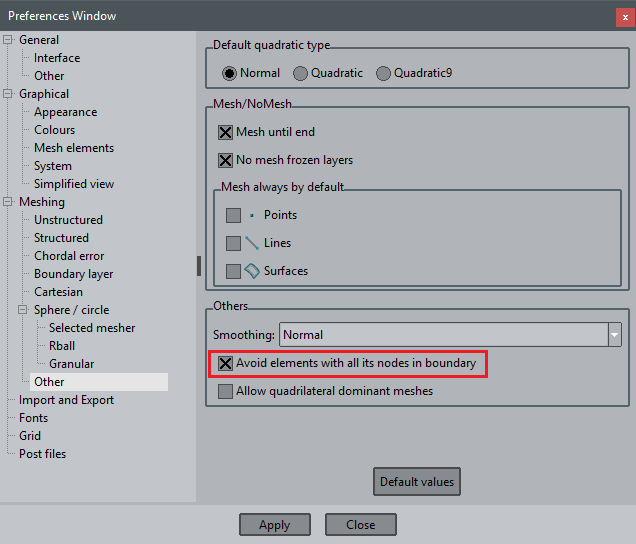 In order to do it you can activate the option Avoid elements with all its nodes in boundary, and the mesh generated by GiD will not have this kind of elements. This option can be found in the preferences window, inside the Meshing->Other branch.